Up to 90% off they say. 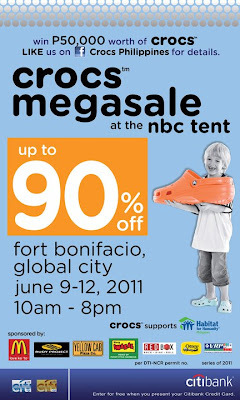 I bet like previous crocs sale, the line would be sooo long that NBC Tent would look like a relief goods distribution center. 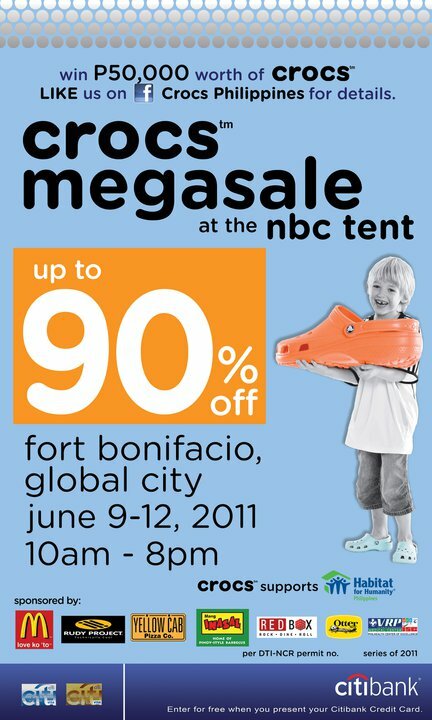 For Crocs fanatics out there, save the date! Other stores should also be giving out sales. 'been to crocs high street today. They offer UP to 50% off only. Hi Anonymous :) I think that's the outlet mismo... the sale starts tomorrow and they should have 90% off as promised. I've been to one of these sales by Crocs (usually co sponsored by Citibank) and I really got shoes at super low prices (3 pairs at Php595).